From the Caspian in the northwest to Baluchistan in the south-east, the Iranian Plateau extends for close to 2,000 km. It encompasses the greater part of Iran, Afghanistan and Pakistan west of the Indus River containing some 3,700,000 square kilometres (1,400,000 sq mi). In spite of being called a "plateau", it is far from flat but contains several mountain ranges, the highest peak being Damavand in the Alborz at 5610 m, and the Dasht-e Loot east of Kerman in Central Iran falling below 300 m.
The Iranian plateau in geology refers to a geographical area north of the great folded mountain belts resulting from the collision of the Arabian plate with the Eurasian plate. 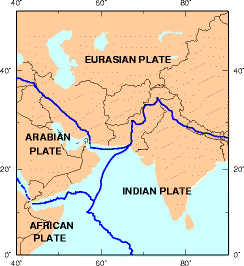 In this definition, the Iranian plateau does not cover southwestern Iran. It extends from East Azerbaijan Province in northwest of Iran (Persia) all the way to Afghanistan Pakistan west of the Indus River. It also includes smaller parts of the Republic of Azerbaijan, Iraqi Kurdistan, and Turkmenistan. ^ James Bell (1832). A System of Geography, Popular and Scientific. Archibald Fullarton. pp. 7, 284, 287, 288. ^ a b c Sykes, Percy (1921). A History of Persia. London: Macmillan and Company. pp. 75–76. ^ "Iran - Plant and animal life". britannica.com. ^ Zarubezhnaia Aziia: Fizicheskaia geografiia. Moscow, 1956. ^ Petrov, M. P. Iran: Fiziko-geograficheskii ocherk. Moscow, 1955. Wikimedia Commons has media related to Iranian plateau.